For Gatorade CMO Morgan Flatley, celebrating the brand's 50th anniversary meant doubling down on the thirst quencher's heritage in a huge way. Starting on Christmas Day 2014, Gatorade unveiled a riveting, 60-second ad featuring 50 classic sports moments from the past 50 years. Tellingly, the narrative began and ended with Gatorade. The exploits of the New York Yankees, Boston Celtics, New England Patriots and other teams and athletes were bookended by the brand's 1965 founding at the University of Florida and footage of the University of Florida Gators from today. By stylishly linking the brand to an entire half-century of sports, the spot drives home the point that Gatorade has been there for the big moments over the years, "fueling the champion within," as the tagline says, stitched into the fabric of major athletics as sure as any record-setting performance or championship season. The spot typifies Flatley's approach as chief marketer at the PepsiCo brand. Building campaigns around important sports moments and using their news value to boost the beverage's profile is what Flatley is all about. "She knows the role creativity plays in solving business challenges and seizing moments in culture," says Brent Anderson, executive creative director at Gatorade lead agency TBWAChiatDay. Who better to take the celebration to even greater heights than Michael Jordan? Gatorade revived its iconic "Be Like Mike" campaign from 1992, a reboot that tallied 500 million impressions. "It's our heritage," Flatley says, "a fun campaign everyone remembers. Bringing it back now [for Gatorade's anniversary] just made sense." Flatley's years in account management at Saatchi & Saatchi gave her a feel for the dynamics of advertising, and helped her appreciate how to work with agencies as partners. 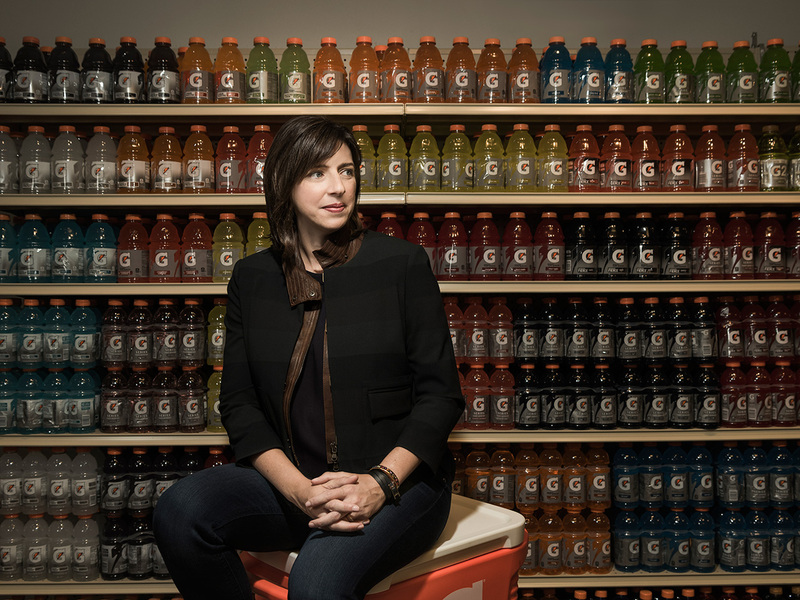 "She deeply understands her business," says Anderson, "and provides us the trust and space to create things that will build love for Gatorade among athletes." The "Made in NY" campaign follows Derek Jeter through New York. Honest emotion permeates the "Made in NY" campaign, which followed the Yankees' Derek Jeter through the streets of New York as he meets fans expressing their appreciation. The joyous surprise folks feel is evident on their faces—and mirrored by Jeter's own reactions. "We met with Derek early on to talk about his vision for the end of his baseball career and how we could support him," Flatley says. "Given our long relationship with Derek, we were really able to collaborate on the story and message he wanted to share." "Made in NY" won a gold Lion at Cannes and the Grand Clio Sports Award. The farewell spot notched more than 10.5 million online views, making it one of the most viewed Gatorade ads ever, plus nearly 1 billion earned media impressions. Another ad, built around Serena Williams' quest to win the U.S. Open and complete tennis' grand slam, deftly employs footage of the legend interviewed as a child phenom and traces her journey from the public courts of Compton, Calif., to the pinnacle of sports. It was one in a series of ads Williams did for the brand. Industry watchers applaud such pop-culture connections, noting that the seamless, unobtrusive product tie-ins elevate spots with Williams and Jeter to the level of great brand communications. "Those anthem-type ads have spread through the mainstream," says David Schwab, managing director at Octagon First Call. "They deserve a lot of credit for taking advantage of the opportunities offered by these spokespeople." Says Flatley, who has worked at Gatorade for a decade: "I've developed a solid understanding of our consumer [the competitive athlete] and have a tremendous passion for them and our role in fueling their performance. If you don't know what you're trying to do with the creative or fully understand who you are trying to talk to, your advertising doesn't stand a chance."